How Do Owls Show Affection? Territorial and aloof, owls have long held a place in human literature and imagination. Though capable of exhibiting affectionate actions, the majority of an owl's seemingly loving behaviors are geared towards mating rituals. As most types of owls are monogamous, they may continue to indulge in affectionate bonding behaviors with their mates during and after raising a brood. Owls are known for being territorial, and may not tolerate other birds in their perceived domain. When the birds form a social bond with another of the same species, they may spend time leaning upon one another. Owls in captivity may spend time on opposite sides of their enclosure should they dislike each other. 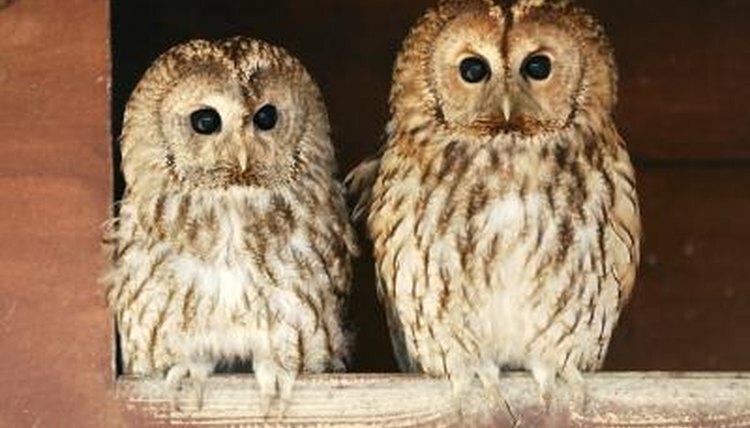 As the mated pair is truly the only social outlet a bird requires, many adult owls shun the company of others of their kind. Grooming is a social behavior that helps owls to form a bond, either as a breeding pair or in a group according to Paul A. Johnsgard at the University of Nebraska-Lincoln. Grooming, called preening, is the practice of combing the feathers with the owl's beak. The recipient owl may respond with twittering noises denoting pleasure. Mutual grooming may help to alleviate aggression in owls, and is practiced by owlets as well as adult birds. Owl handlers report preening attempts from their charges, and the owls reportedly enjoy scratching by human fingers. Certain types of owls may display cheek-rubbing or bill-fencing as a courtship display, according to the University of Nebraska-Lincoln. While it is an integral part of an owl's courtship routine, newly-active owlets have been seen engaging in the behavior as well. This important pair-bonding ritual may not just be associated with courtship, but can occur in siblings as well. These behaviors, along with tongue clicking, are important bonding tools in an owl's repertoire. Male owls may bring females gifts of food when anticipating courtship, according to the University of Nebraska-Lincoln. Similar rituals may occur at the nest, when the female must incubate her eggs and when the pair is raising their owlets. The male owl may be observed with open fluttering wings while presenting the gift held in his beak to the female owl. Such behavior is believed to occur before courtship and signifies the forming of a new monogamous owl pair. Older owlets have been observed attempting to feed their younger siblings in the nest. Why Does a Sun Conure Vibrate its Mouth on my Finger? How Did Screech Owls Get Their Names?